Monte Vista is in Rio Grande county. Anthem BCBS has 14 unique providers in Rio Grande County. Anthem BCBS has 0 unique facilities in Rio Grande County. Anthem BCBS has 14 total unique providers + facilities in Rio Grande County. Bright has 25 unique providers in Rio Grande County. Bright has 0 unique facilities in Rio Grande County. Bright has 25 total unique providers + facilities in Rio Grande County. 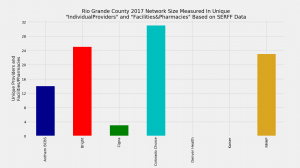 Cigna has 0 unique providers in Rio Grande County. Cigna has 3 unique facilities in Rio Grande County. Cigna has 3 total unique providers + facilities in Rio Grande County. Colorado Choice has 29 unique providers in Rio Grande County. Colorado Choice has 2 unique facilities in Rio Grande County. Colorado Choice has 31 total unique providers + facilities in Rio Grande County. Denver Health has 0 unique providers in Rio Grande County. Denver Health has 0 unique facilities in Rio Grande County. Denver Health has 0 total unique providers + facilities in Rio Grande County. Kaiser has 0 unique providers in Rio Grande County. Kaiser has 0 unique facilities in Rio Grande County. Kaiser has 0 total unique providers + facilities in Rio Grande County. RMHP has 20 unique providers in Rio Grande County. RMHP has 3 unique facilities in Rio Grande County. RMHP has 23 total unique providers + facilities in Rio Grande County. Jay operates a health insurance brokerage in Colorado, where he helps individuals and small groups obtain and maintain health insurance coverage. Complimenting his work as a health insurance broker, Jay also provides data analysis and creates visualizations that are easily understood by consumers and other stakeholders in Colorado’s health insurance market.